DAN O’DAY TALKS ABOUT RADIO - Straight talk about radio programming, radio advertising, radio production...Well, you get the idea. A Loyal Reader sent me this radio spot. (Effective) Radio Advertising Solves Problems. Let’s assume that, for babysitters, that’s a genuine problem. But this radio ad doesn’t target babysitters. It speaks to people who employ babysitters. What problem does “pay your sitter easily with Zelle” solve for the employer? The opening line of your commercial is the commercial for the commercial. It’s your one opportunity to command the attention of the targeted listener — in this case, a bill-paying parent (or, more broadly, people who pay personal bills via check). On a scale of 0 to 100, how successful is this opening line at commanding the attention of “people who pay their personal bills via check”? Did I hear you say, “Minus 50”?? – People who are at least somewhat familiar with the product but haven’t become persuaded it’s something that would benefit them. Does the Call to Action send them someplace (e.g., the advertiser’s website) that might show them how much better their lives will be with Zelle? Yep. We’re all familiar with “Primacy” and “Recency,” right? The final words of your commercial have the greatest chance of being remembered, of reverberating in the prospect’s mind even after the spot has ended, of making a lasting impact on the targeted listener. And what’s the Big Important Thing we really, really want the targeted listener to remember? Download free radio copywriting audio seminar here. The other day in the private group for The Accents Class, someone mentioned, regretfully, that the production of a play by George Bernard Shaw, in which he’s performing, is reaching the end of its run. “You familiar with The Shaw Festival?” I asked. 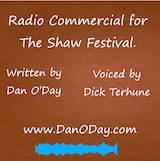 That prompted me to share one of a number of radio commercials I created several years ago for one of my all-time favorite clients: The Shaw Festival at Niagara-on-the-Lake, Ontario. Why Are They One of My All-Time Favorite Clients? Great people to work with. Smart, creative…and not afraid to consider addressing their target audience differently than most theaters ever would talk to their patrons. Great product — world-class productions of world-class plays. They Weren’t Too Lazy to Answer My Research Questions. They made my job as copywriter easy by thoughtfully answering the 37 questions I posed to them. While they may have wondered why I would ask some of those questions, I had no way of knowing which question(s) would present to me the clue that cracked open the story I would need to tell. In this instance, it was a question about the most common reasons that prevent theatre-lovers from attending as frequently as they should. They Didn’t Balk at the Prospect of a Radio Advertising Campaign that Accuses the Advertiser of Having Been Less than Honest. They didn’t freak out when the commercials I wrote acknowledged and even amplified one of the key objections that needed to be overcome. Hopefully you’ll be able to figure out what that big objection was. In this video, we wrap up my interview with the guy many people consider to be the best dialect coach in the world, Jim Johnson. * Playing with Swedish, French, German, Northern Irish, Caribbean, New York Jewish, Pittsburgh, and Yorkshire accents. Hey – This is the final installment of my conversation Jim, but I’ve got 3 more videos devoted to dialects & accents for you. So I can let you know when the next one is ready, join the Alert List at https://danoday.com/the-accents-class.